Each of these activities capitalize on students' love of pumpkins. Fall is the season that students begin the search for their own "perfect pumpkin" so these activities were created to help students develop mathematical concepts using a pumpkin theme. This seasonal mat uses two different size pumpkins to model addition problems. Students roll a die and place that many pumpkin seeds on the first pumpkin. They roll the die again and place that many pumpkin seeds on the second pumpkin. Next, students write the number sentence that tells how many seeds there are altogether on both pumpkins. Students may use actual dried pumpkin seeds for a seasonal flair. As an alternative, students may draw seeds (spots) on each pumpkin to picture the roll of the die. Place the pumpkin mat in a sheet protector and use dry erase markers for a reusable classroom activity. Place the materials in a math center for additional student practice. 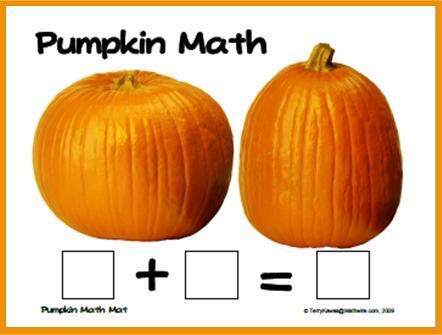 Download the Pumpkin Math Mat. Pumpkin Line-Up: Each student should have a small pumpkin. Place students in groups of 3-4. Tell students that they are going to line up each person's small pumpkin in order from the lightest (pumpkin that weighs the least) to the heaviest (pumpkin that weighs the most) by holding each pumpkin and estimating. Model this procedure with a pumpkin from each group. Talk aloud to model the thinking students should use as they complete this task. 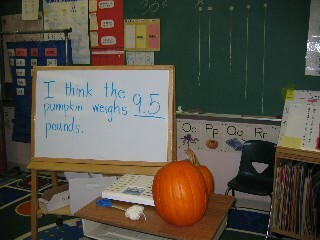 Once students have decided on the order and recorded it, students should actually weigh the pumpkins to check their order. Pumpkin Belt: Place a larger pumpkin on a table in the classroom. Ask students to look at the pumpkin and imagine making a string belt to go around the widest part of the pumpkin. Without actually measuring, they are to cut a piece of string they think will be just big enough to be a pumpkin belt. After each student cuts a belt, he/she should wrap the belt around the pumpkin to check. Then have students hang their string and record it in the class graph as too long, too short, or just right. The Symmetric Pumpkin Challenge, created by Rose Hummer, a New Jersey teacher, challenges students to complete the picture on the other side of the line of symmetry. Symmetric Pumpkins: Use orange and black or orange and yellow paper to create symmetric pumpkins. Begin with a symmetric orange pumpkin that is created by drawing the outline of half of the pumpkin on a folded sheet of orange paper. Then use 1/2 sheet of black or yellow to create the facial features of the jack-o-lantern following the directions for Symmetric Faces. 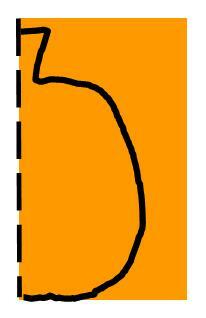 Students simply use the legend to draw in features and then color this Jack-o-Lantern Glyph to record data. Mrs. Schulman used student Pumpkin Glyphs to create a seasonal bulletin board. 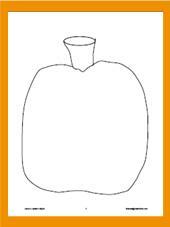 This Jack-o-Lantern Glyph lesson plan from Teacher.net starts with a pumpkin cutout. This month's featured graphing format is the clothespin graph which captures data from simple yes-no questions. Use a piece of oaktag or foam board to construct the actual graph part that is reused. Write the question on a sheet of paper and attach it to the top of the board. Provide clothespins for students to use to affix to the yes or no side of the graph. 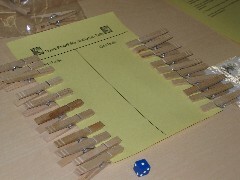 Some teachers write student names on the clothespins so that it is easy to see who did or didn't vote yet. Have you ever gone to a pumpkin farm to pick out a pumpkin? Do you like to eat pumpkin seeds? Have you ever carved a jack-o-lantern? 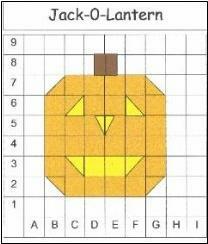 This activity require students to use coordinate pairs to correctly color in the squares of the grid to reveal a Jack-o-Lantern. Students learn to identify ordered pairs using letters and numbers to define a space. It is critical that students learn that the horizontal name precedes the vertical name in ordered pairs. This makes it easier for students to expand this skill to coordinate pairs that name the intersection of two lines. Download the Jack-o-Lantern coordinate graphing activity. The Biggest Pumpkin Ever by Steven Kroll is a great introduction to the Pumpkin Belt measurement activity described above. How Many Seeds in a Pumpkin? by Margaret McNamara develops both math and science concepts using the seeds in a pumpkin. Students practice counting seeds by 2s, 5s, 10s and learn that the more lines a pumpkin has, the more seeds it will have inside. 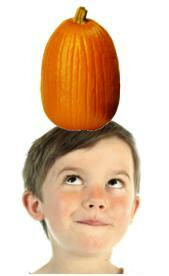 Create the fall sequel booklet, Ten Pumpkins Up on Top, in which students balance pumpkins on their heads. The pdf file contains a cover and a sample student page that may be copied so that students can draw pictures of themselves in costume, balancing 10 pumpkins. 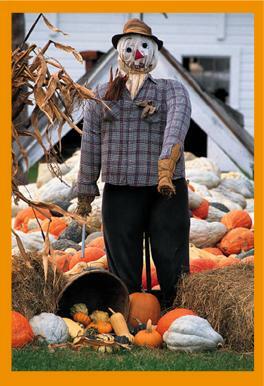 Or, create a class counting booklet with each student balancing increasing numbers of pumpkins, as assigned. Download the 10 Pumpkins Up On Top! booklet. 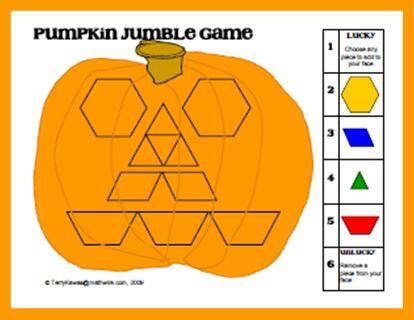 Pumpkin Jumble Game: students toss a die to get pattern blocks to add to create a jack-o-lantern face. The first person to complete his/her jack-o-lantern wins the game. This game develops the concept of probability of a single die as students also have opportunities for Lucky or Unlucky tosses that add a twist to the game. Data Collection & Analysis: This simple game provides a great opportunity for data collection and analysis of the probability of a one-die toss. Simply have students use the Pumpkin Jumble Game Data Recording Sheet to record each die toss. After completing the game, students may add their results to a class data table to see if each number does indeed have an equal chance of winning. Let each student play independently until he/she completes the jack-o-lantern. Each student should use the Pumpkin Jumble Game Data Recording Sheet to record each die toss. Total the number of die tosses needed to complete the jack-o-lantern and add this data to a class line plot. Analyze the class results to determine the average number of tosses needed to complete the jack-o-lantern. This game was designed to provide practice in reading coordinate pairs. First students arrange 12 pumpkins on their own Pumpkin Farm mat, making sure their opponent cannot see where they have placed the pumpkins. It is easy to stand up folders to block each student's view of the other pumpkin farm during the whole game. Once the pumpkins have been planted, the first student calls out the coordinates for an ordered pair (i.e. A3 or D6). If the other player has a pumpkin on that space, Player 1 captures the pumpkin and the points. Play continues in this Battleship-type game until one player finds all of the pumpkins or time runs out. Students use a recording sheet to mark their guesses and whether or not they have captured a pumpkin. Download he Pumpkin Farm Game. 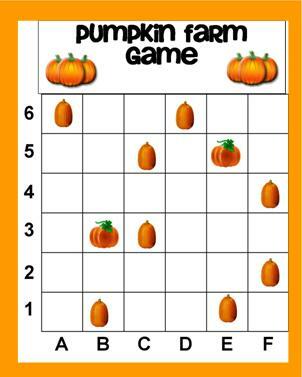 The pdf file includes the Pumpkin Farm game mat, pumpkin pieces, directions and a recording sheet. The directions also provide different options for ending the game. Pascal's Pumpkins is an activity from the Rutger's Discrete Math collection, revised by Mathwire, that challenges students to analyze the patterns in order to complete the array. The file contains the student handout as well as an explanation of the different patterns students may find and the solution. Pumpkin Picking challenges students to solve a pattern problem. The solution provided details how students might use a table to organize the data and easily identify the correct answer to this problem. Jack-o-Lantern Combinations challenges students to figure out how many different pumpkins may be made, given the assortment of eyes, noses and mouths. This problem provides an opportunity to expose students to the concept of orderly counting where they exhaust all possibilities for one component before moving to the next, so that they exhaust all possibilities without duplication. Pumpkin Farm is a sneaky way to get students to analyze the meaning of remainders in long division. Students must figure out which character will be the 100th to be printed on a neon signboard. 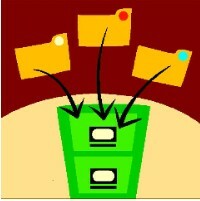 The file contains the student handout as well as a detailed possible solution. Have students solve some problems about Big Pumpkins which includes a table on the size of the largest pumpkins through 2002. Follow up by having students research the size and weight of more current largest pumpkins. Be sure to visit the Pumpkin Patch to view pictures of award-winning Atlantic giant pumpkins so that students appreciate the actual size of these weighty pumpkins. Pumpkin Math on October 31st Instead of Halloween Parties includes many suggestions for pumpkin activities. Read a librarian's Pumpkin Math lesson plan for including math activities to coordinate with the book How Many Seeds in a Pumpkin? by Margaret McNamara. 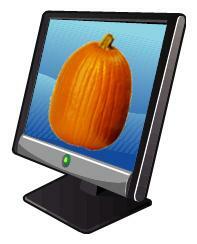 Download Pumpkin Math for a quick pumpkin data recording sheet.